With the new iPad 2 (s aapl) on the way, many teams may be considering whether iPads can replace laptops as productivity tools for remote workers. Right out of the box, the iPad includes email, contact, notes and calendar apps that will be more than adequate for many workers. If your team is already collaborating in the cloud, there are iPad apps for just about every cloud service, including WWD favorites such as Google Apps, Dropbox, Egnyte, Evernote, Simplenote, Toodledo, and SugarSync. And connections to Apple’s own MobileMe sync service are built into iOS. As Darrell wrote recently, there are a number of useful productivity apps that make the iPad surprisingly useful. I’m not saying that an iPad can replace a fully-equipped laptop, but with a foldable Bluetooth keyboard, it can be a lightweight way to get a little work done in a pinch, especially as you can use one of the many remote control and screen sharing apps available for the iPad to remotely access and control an office computer. Here are a few options. These apps connect to proprietary client software running on the computer in your office, and generally have the advantage that they can operate through firewalls and tend to be easy to set up. GoToMyPC. This is an app that I wrote about recently. Note the developer no longer requires a credit card to create a trial account if you sign up from within the iPad app. LogMeIn Ignition is available for iPad and iPhone. Sam reviewed it here. RDM+, an app that I wrote about a while back. TeamViewer’s iPad app is available in free (non-commercial) and Pro versions. I reviewed it here. These solutions require a VNC or RDP server to be running on your office computer. As I recently wrote, there are a number of VNC server options available. Macs have VNC capabilities built in, and some editions of Windows (s msft)Windows XP Professional, Vista, and Windows 7 come with RDP. Both VNC and RDP require configuring firewall rules and ports, which can be tricky. iTeleport uses VNC, but offers an option that claims “to leverage Google’s infrastructure to simplify the connection setup for you” by authenticating through Gmail (s goog). I haven’t tested it, so I don’t know how well it works. Jump Desktop supports VNC and RDP. Mocha Remote Desktop supports only RDP. 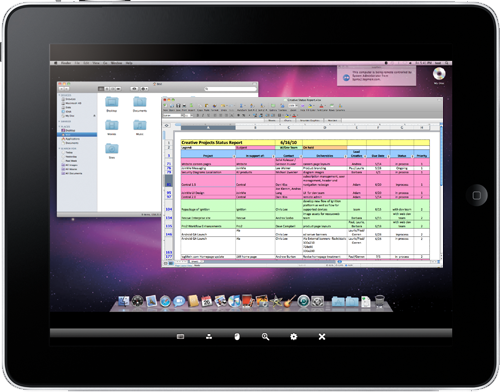 PocketCloud supports VNC and RDP; available in Standard and Pro versions. Screens, a VNC app that Darrell recently reviewed. 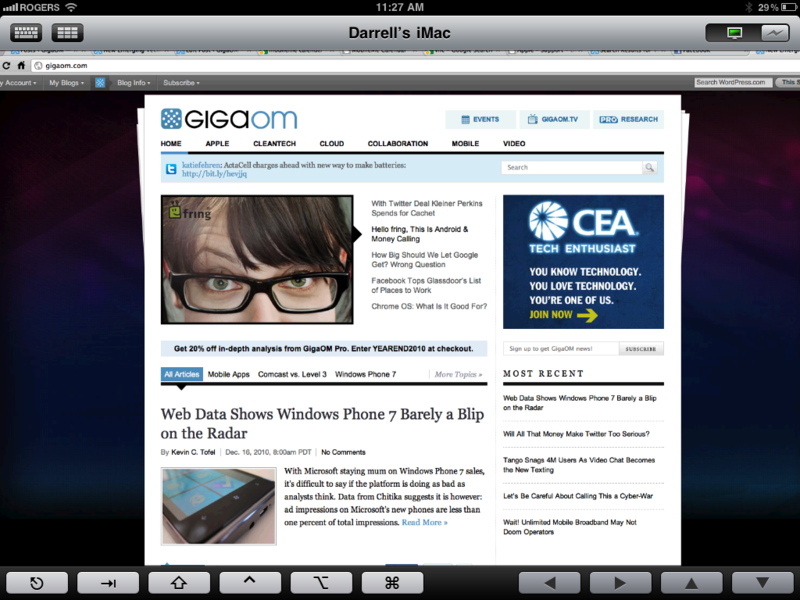 VNC Viewer for iOS. I reviewed the Andorid version of the app here. Do you use an iPad for teamwork? How do you connect to your office? I’m looking to use my ipad as a “remote control”. I’d like to be in my backyard, and be able to scroll through my itunes library that’s on my home desktop, to remotely play tracks… would an app such as gotomypc allow me to do so? after reading reviews, it’s seeming like gotomypc would be used for viewing docs etc… is this possible? help! Another proprietary solution is RemoteView by Rsupport (www.rview.net). Available on iPad, iPhone, Android. 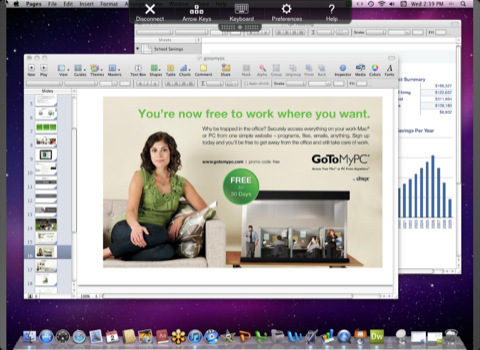 You didn’t mention the Citrix Receiver, which turns an IPad into a full windows desktop using Citrix XenApp Servers. Its a corporate solution, but IPad use by senior managers is driving its adoption. Just to add to the list we now have a VMware view client for the iPad. Access your desktop from your iPad.